What's the First Easter Myth? Good church people sometimes get upset when they discover that there are whole lotta people in their neighborhoods who don’t seem to understand what Easter is all about. We live in a culture that is increasingly unaware of what most church people think are “the basics” of Christianity … and when someone outside of the church culture hears the stories they’re, well, skeptical. Think about it … our religion is based almost wholly on a belief that a man who was actually God willingly left his god-ness behind in the heavens somewhere. Then he allowed himself to get convicted of some trumped-up charges and, the man who was actually God, let himself be beaten and executed … but three days later – after he was dead and buried – he came back to life. Really? What thinking person would say, “Oh yeah. That makes perfect sense”? But if you’ve been raised in the church or in a church culture (that is, born before about 1965), we just accept it as real. And if someone dares challenge it, we’re unsure what to say or do. How do you defend a story like that?! Are we really surprised that there is a growing belief that the Bunny isn’t the only myth on Easter? This week, our Conversation will explore that reality. 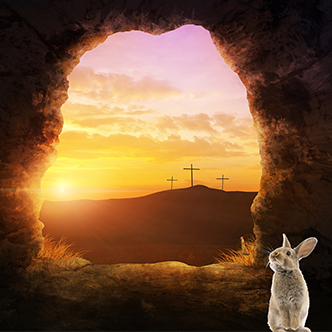 And I’ll even share a couple of reasons why I, a scientist’s son who was raised on empirical truth, believe that the resurrection was the real thing.